When it comes to tradeshows, everything needs to be perfect. The smallest wrinkle in the tablecloth can reflect badly on your company and your emphasis on attention to detail. Your customers want the best of quality and value from you, and if they see you not caring about the quality, that will hinder your trustworthiness. That is precisely why you need the best 3-sided custom fitted table covers made from highest quality and made to perfectly fit the table at tradeshows. At Bannerbuzz, we use the best quality fabric and material to make custom 3-sided custom fitted table covers for your company. From size to colors, our custom fitted tablecloths are made according to your needs. We make sure that the table aligns well with the rest of the tradeshow display and that the custom fitted tablecloths stay flawlessly wrinkle-free throughout the event. The aesthetical aspect is not the only factor that makes our three sided custom fitted tablecloths the best best for tradeshows. There is a powerful practical and functional aspect to the product. First of all, while three sides drape around the table concealing all that is underneath it from the customers, the fourth side drapes just 10 inches and gives you an easier access to all your files and stuff lying underneath. So, if you are sitting with a prospect, you won't have to awkwardly raise the custom fitted tablecloths to find the files or products you need to show them. Everything will be right there in sight and easily accessible. Since one side is stitched to fit, you won't need table toppers or clipping to hold the cloth in place. It makes our three sided custom fitted table cover a more convenient option when compared to typical table skirting traditionally used in tradeshows and conventions. In short, whenever there is a need for a table when one or more of your representatives are required to be sitting on one side, three sided cover is the most functional option. 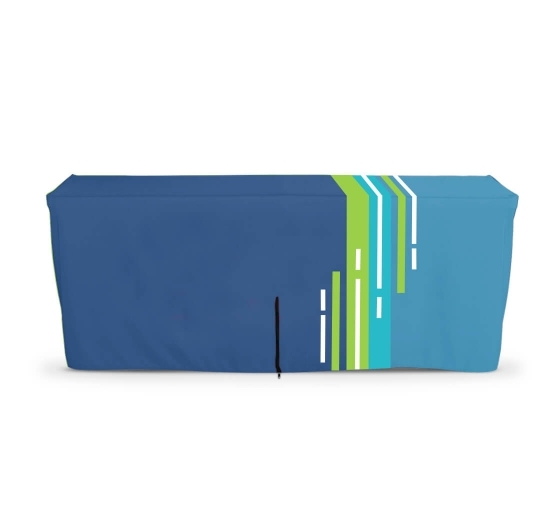 While the three sided custom fitted table cover has many innate benefits, Bannerbuzz add to the advantage through our guaranteed quality or color and fabric. More importantly, we ensure the best value for your money with our competitive pricing and customization. We can custom print the covers with your logo or branding graphics. We also offer a plethora of fabrics and material to choose from. Poly premier, spandex, damask, or name any other fabric best suited for your needs, we have it all. Moreover, we cater to special material needs such as spill repellent or fire retardant fabric. In simpler words, Bannerbuzz offer the value you are seeking in a long term pattern. If you have a unique requirement for your 4-Sided custom fitted Table Cover Zipper back, just give us a call and we will create a custom solution for you.